romatic Fruity fragrance for men. 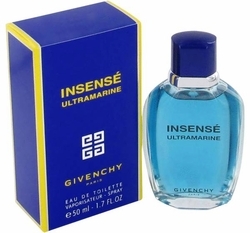 Insense Ultramarine was launched in 1995. Top notes are black currant, galbanum, bergamot and watermelon; middle notes are magnolia, carnation, iris, mint, sage, lily-of-the-valley and cardamom; base notes are cedar, vetiver and tobacco.